IHSE (stand 7.A09) expands the Draco ultra high-end extender series with Cat X transmission of video signals up to 4K60 with the same image quality as fibre-optic extenders. Combination of Cat X and fibre optics in matrix switching applications is also possible. Users benefit from a considerable cost saving using an existing Cat X infrastructure, rather than replacing it with fibre. 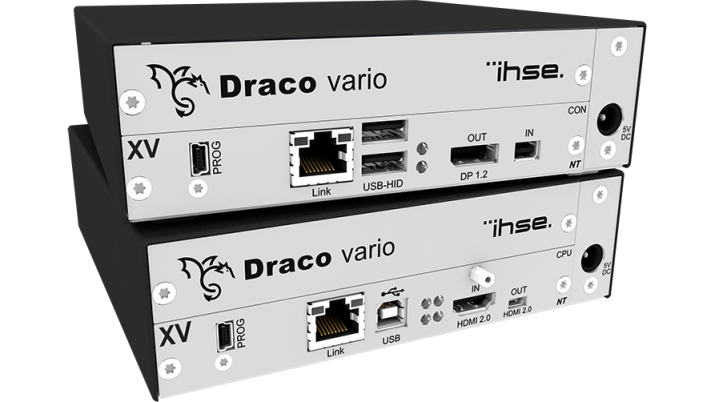 IHSE’s Draco ultra KVM extenders deliver unprecedented quality with imperceptible latency in the transmission of high definition video, with keyboard, mouse, and data signals. The series was developed in cooperation with the Fraunhofer Institute for Integrated Circuits (IIS) and is regarded as industry-leading technology for KVM signal extension. For ultra-high-resolution video signals, IHSE offers Extreme Velocity (XV) extenders. The XV series is now offered with Cat X devices to supplement the original fibre versions. The new XV models support DisplayPort 1.2 and HDMI 2.0, enabling transmission of 4K60 video with a color depth of 10 bit per RGB colour channel and optimal 4:4:4 color sampling over a single Cat X connection. The expansion of the series enables users to integrate ultra-high-resolution video signals into Cat X infrastructures. Existing copper cabling no longer needs to be replaced by optical fibres in order to support the maximum resolutions and frame rates.